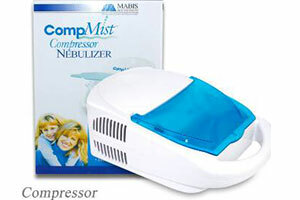 The CompMist Compressor Nebulizer delivers aerosol medication therapy with clinical accuracy. Its easy use to one button operation makes it ideal for all ages. Storage compartments for the power cord and accessories are built in the compressor for added convenience. The non slip pads on the bottom ensure that the unit will sit securely to any flat surface.